Beginning next year, guests at Epcot at the Walt Disney World Resort and Disney California Adventure park at the Disneyland Resort will undertake a whole new Soarin’ journey when Soarin’ Around the World opens at both locations. This new experience continues the recent updates to the popular attraction, including all-new digital screens and projection systems at both locations. Soarin’ Around the World will take guests on a journey to far-flung lands, over some of the world’s most unique natural landscapes and man-made wonders. It will use the same technology that will make the Shanghai attraction, Soaring Over the Horizon, so spectacular, ensuring that the very best Disney has to offer can be experienced at Disney Parks around the world. I truly hope Soarin’ keeps the original film and just adds the new one. It would be great to have both films as an option. Also, the existing soundtrack by Jerry Goldsmith is one of the most beautiful pieces in all of Disney parks. Will Soarin Around the World be in a separate building from the current Soarin’ (over California)? I assumed that the new screen (third) added to the existing Soarin’ (2 screens) would all show the new digital version of Soarin’ (over California). Soarin is great, but I’ve been wondering when it would get an update with modern technology. Let’s have a Pandora version, please. Or around the solar system. Olympus Mons, Saturn’s rings anyone? Awesome! I’ve always thought this ride would be better if it were around the world! I just hope the music stays, it’s a great piece by the late Jerry Goldsmith. My daughter absolutely loves Soarin and I really hope she gets to go on it again when we visit at the end of March 2016. she is really looking forward to this ride. Will it be open by March 25th, 2016? Seriously! What the even heck…. Why even call the park “CALIFORNIA Adventure” if there’s nothing in it that has to do with California? All of the California themed elements are slowly turning into generic Disney promos for their latest movie. Soarin’ over California is one of the most iconic attractions at Disneyland Resort, including Disneyland attractions. Yes, please update the ride with new footage and technology but keep it at least remotely similiar to what Disneyland fans have come to know and love for almost 15 years…… At least give Soarin’ fans the option of either California or the world, maybe have 1 theater play California and the other one the world. We are looking forward to the new changes. I am sure the soundtrack will be wonderful, old, new, or a mix. Loved the CA version… I hate to see it go away entirely. Wonder why you can’t have both World and CA as options… seems like it would make people want to ride it twice and would be more bang for your buck. Looks awesome!! Please keep the original music and Patrick Warburton! Another vote for the awesome original soundtrack. I know of two blog readers that would volunteer to play that soundtrack live on opening day in the new theater they are building at Epcot. Surely there are 48 other blog reader musicians out there to form an orchestra. Amazing Erin, thanks! I’ve mused before that expanding Soarin’ beyond California would be such great fun, it’s great to see Disney doing it! I hope that they will keep the original, too! But I am excited to experience the new ride! Can’t wait to see that!! Looks like there will be some really stunning visuals! I agree with my fellow Disney fans when I say, PLEASE KEEP THE ORIGINAL MUSIC! The score itself is so gorgeous and symbol for the ride. It would really be ideal to keep it so fans can experience some of the old with the new! Also, it would be interesting to see how the music blends in to the new footage! Cannot wait to experience this new version ! this is one of our favorite attractions at WDW and it can only get better ! Please give your guests the option of which movie they want to see. Love the music and Soarin over California. I would like to see different things in different parks. When I come to CA I enjoy the CA things. Please don’t get rid of the original! 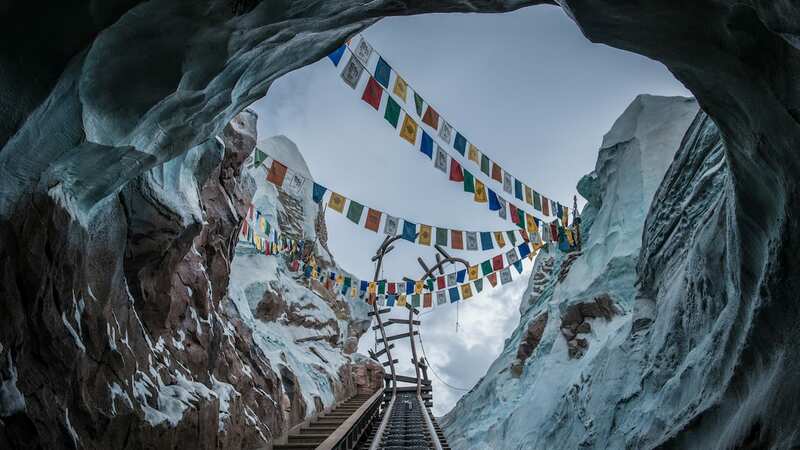 Exactly how does this fit into the theme of “California Adventure” or the Grizzly Peak Airfield theme? Will the score by Jerry Goldsmith remain? Will we still see Michael Eisner driving a Mickey-logo golf ball at us on the ride? PLEASE– keep the music. Nothing can top the original. I have been to the Soarin’ journey back in 2006. Looking forward to seeing the newest version. What a surprise! I thought Shanghai had an exclusive on Soarin’ Around The World for five years, I think it was. Here is hopes that it is voiced once again by Patrick Warburton. I have to agree with the soundtrack comment… I hope either the soundtrack stays the same or that the new soundtrack is just a modification of the original… The original is incredibly epic! Looks like it will be a great update to a wonderful ride. Do you know when it will go live? We’ll share an opening date as soon as we can. I hope you’re not planning on replacing Jerry Goldsmith’s masterpiece. Please don’t get rid of the music! Is there a more specific timeline other than “next year”? When next year? We’ll share specifics on timing as soon as we have them. The critical question is whether Patrick the Flight Attendant will record a new intro for when you’re in line. Long live Puddy ! This info looks fantastic as I would expect from Disney! Hopefully they were able to get rid of the view of the feet of those above that created such a distraction it kind of ruined the ride for me. Please tell me the soundtrack will stay the same though? Soarin’ is the best piece of music anywhere in Disney Parks!! I don’t have information on the soundtrack at this time, but we’ll have more to share over the next few months. I’m totally impressed with this sneak peek. Looking forward to experiencing this once this is up and going. One of the most incredible rides in Disney! Love, love, love it! Can’t wait to go next year to see it! Looks amazing. Is the original Soarin being replaced completely? Or will guests have the option of choosing either experience? This will be a completely new experience.